Romance, relaxation, fine food and birdsong make this perfect pocket of Australia a true piece of tropical paradise. The route up the Captain Cook Highway from Cairns to Cape Tribulation has to be one of the most exhilarating roads to cruise along in Australia, if not the world. The highway hugs the gently undulating coastline, and is beautifully sandwiched between two world-heritage-listed natural phenomenons that people travel across the world to experience: the Daintree Rainforest and the Great Barrier Reef. On one side of us, the massive expanse of ocean is glittering like a field of sapphires and diamonds under the sun, and on the other, the rainforest cloaks the towering mountains that seem to shape-shift as the shadows of heavy cumulus clouds roll by above them. Way off in the distance, Cape Trib, as she's known, juts out into the water like a gigantic half-submerged green sea turtle, the fine line of white sand looking like its soft underbelly. We’ve promised one another that we’ll ditch the gadgets for a romantic weekend away, and so we snap away on our trusty old SLR, capturing this magical part of Australia that lures in 4WD drivers like bees to honey. There’s a steady line of them ahead. Roof racks piled with tents, kayaks and surfboards, and mountain bikes strapped to boots are sure signs that this part of the world is made for adventure and getting back to nature. Who doesn't love the sound of a wild bird chirruping away to its heart’s content? Not only is it a sign of a thriving environment, it usually means that that you've managed to escape the city and are in a place where nature reigns supreme. Driving into the magical grounds of the Daintree Ecolodge in Far North Queensland, one thing is very clear: there are thousands of ecstatic birds enjoying the thick jungle canopies where architecturally designed cabins peek out of their verdant hidey-holes. Their song is almost deafening. Wooden staircases, storybook bridges and quaint seating nooks made for two boost the romance factor, and the tropical gardens with towering fern trees transform the scene into a postcard brought to life by the flurry of bird wings and the croaking of green tree frogs. The lodge was the first of its kind when it opened in Australia in the 1980s, and it has always championed 'indulgence with a conscience', with the managers past and present aiming to make a positive contribution to the local environment and community. All produce in the lodge's Julaymba Restaurant is locally sourced, with chef Simone Watts being a passionate supporter of the region’s abundance of exotic edible offerings. She has access to blueberry farms and avocados bursting with flavour, and a dazzling array of fruits such as Davidson plums and the endemic Boonjie tamarind. Simone is always changing the menu, and the food is some of the best you’ll find in all of Queensland. 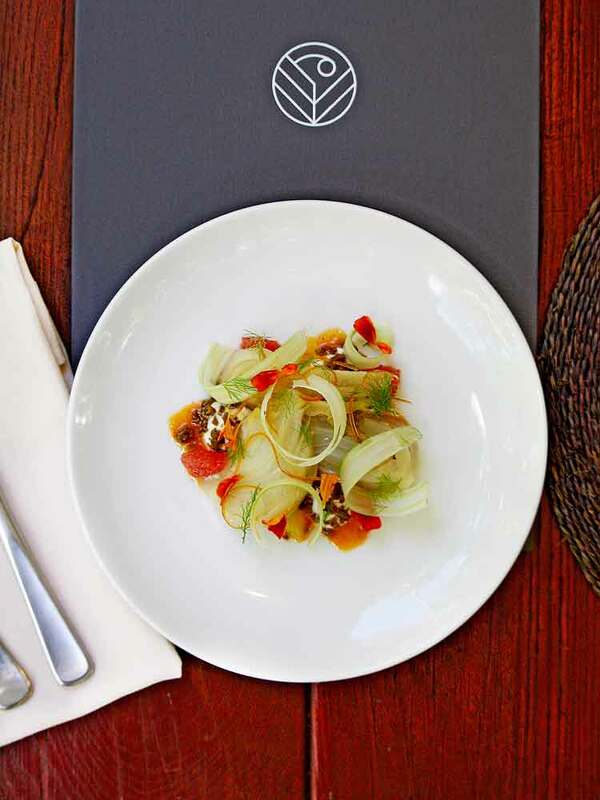 The kangaroo dish is one of the restaurant's signatures, crusted in native pepper, marinated in soy and crushed ginger and served with a tea-soaked egg using local Daintree Estates tea, miso cream and a wasabi granola. It's garnished with pickled ginger, marigolds from the Lodge's expansive garden and bamboo charcoal salt. You won't want to leave your suite. Spacious, light-filled and modern, each is graced with an enclosed balcony extending into the forest. However down in the restaurant, bar and loungeroom where guests gather after a day of exploring, you’ll feel just as relaxed. The staff are as welcoming as friends, and the views, wherever you sit, are nothing short of spectacular. There's nothing like escaping the cooler weather down south and being ensconsed in the balmy days and nights that Queensland offers, however no matter what time of year it is, you have to be wary of saltwater crocodiles. The further north you go, the more rivers, beaches and waterholes are out of bounds. 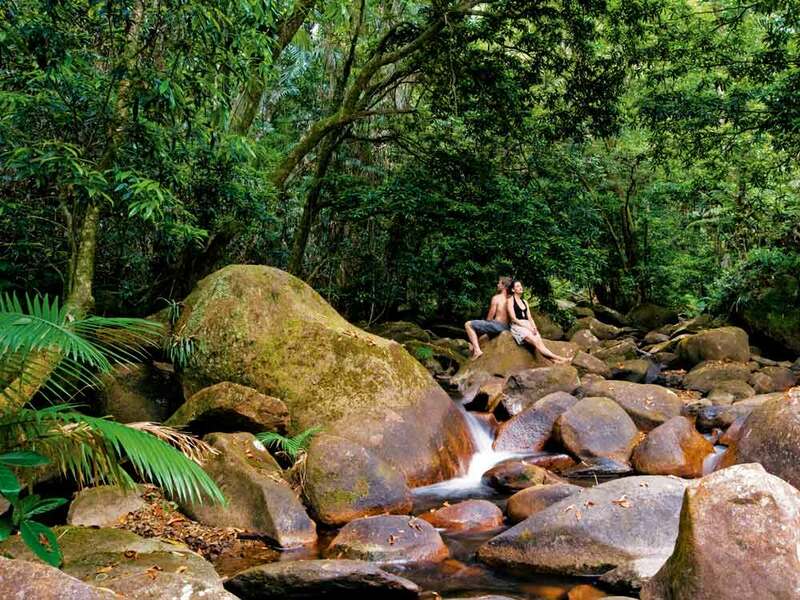 So for travellers enjoying this region, Mossman Gorge, located in the southern part of the Daintree National Park, is a slice of swimming heaven. The rock pools are deep and cool all year and the sun streams through the forest canopies, warming up smooth rocks where you can sunbathe while listening to the sound of the cascading rapids and waterfalls. Within minutes of arriving, we've spotted a couple of stately looking water dragons, a shy green tree frog, and constant little bursts of vivid colour throughout the forest let us know that kingfishers, honeyeaters and Ulysses butterflies call this haven home. There are gentle walking paths winding throughout the rainforest, and a suspension bridge from which you can get a great view of the rapids far below. 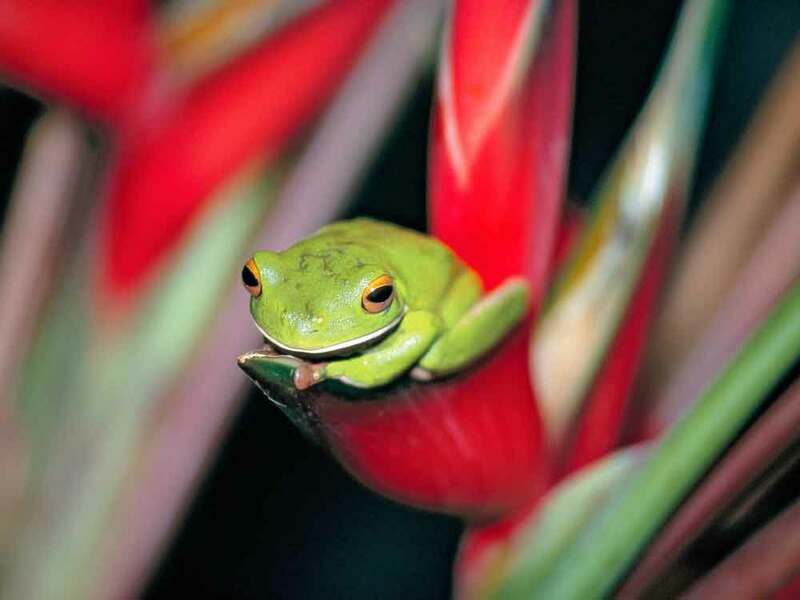 We fit in a Dreamtime Walk tour to gain some insight into the ancient flora and fauna of Mossman Gorge, as taught by local Indigenous guides from the Kuku Yalanji (also known as the rainforest people). Our guide's grandfather and his family for 50,000 years before him lived in harmony with the environment here. Their borders extend from Port Douglas in the south, to Cooktown in the north and Chillagoe in the west, but from WWII onwards, the Kuku Yalanji mainly lived around the Mossman River. Since 1986, these guides have been sharing the knowledge and stories of their ancestors with visitors, however it was Kuku Yalanji elder Roy Gibson who had a dream of something even more impactful. He wanted to create an educational facility that would bring more opportunities to his people, while preserving their culture and the land they call home. Gibson's dream became a reality in 2012 when the $20 million Mossman Gorge Centre opened. The centre provides Indigenous employment and includes a residential training facility. There's also a cafe selling simple meals and beverages using locally sourced produce and Indigenous bush ingredients, with a deck so that guests can sit outdoors by the forest. There's also an art gallery and retail store to showcase and sell Kuku Yalanji art, crafts and products, with everything from paintings and prints to fabrics, diaries, beach towels and so many other pieces that capture the magic and spirit of this special place. The Daintree Rainforest is estimated to be over 125 million years old, making it the oldest tropical lowland rainforest in the world. In our round-up of some of Australia’s top city and regional galleries, we show you where to go to view some of the best art collections in the country. With its remarkable sinkholes and sunken gardens, Mount Gambier is a stunner. And with its world-class wine and food offerings, the Coonawarra is an insatiable seducer. Whatever you fancy, after a visit to the Limestone Coast, you’ll become one of her many lovers.